Map concept and design by JNF Tatham cargocollective.com/jnftatham. There’s a lot going on in Fitzrovia. Its history is packed full of surprises but also the area is changing fast as property developers rip down buildings, erect glass, steel, pre-laid brick facades, and pastiche Georgian frontages. Our community festival takes an overview of the changing landscape and tells the story of this inner city neighbourhood from the point of view of those who live here. Please see our events page and enjoy our hand-drawn map to help you get around. Festival will run from Saturday 18 to Saturday 25 June 2016. More information in the coming weeks. 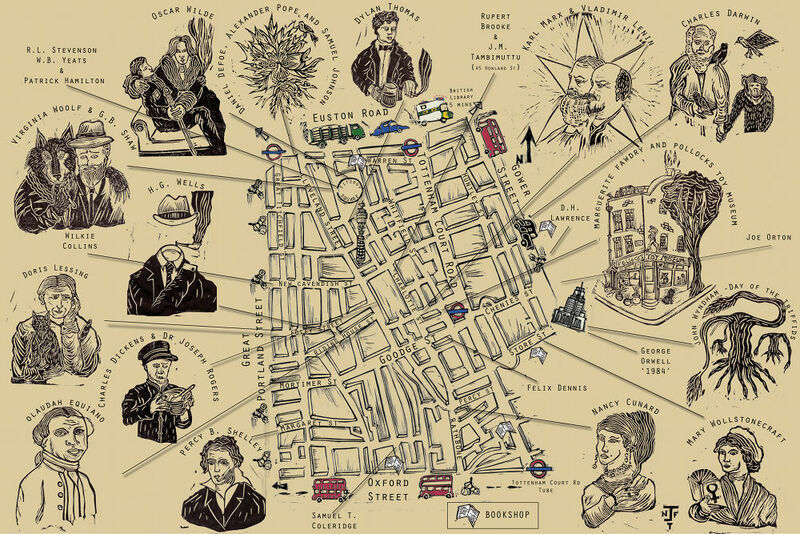 Fitzrovia Festival is a non-commercial celebration of the neighbourhood’s life and history organised by the Fitzrovia Neighbourhood Association. This entry was posted in Fitzrovia Festival 2016 and tagged events, Fitzrovia, London. Bookmark the permalink.